After Arizona's Mesquite Elementary School developed Reteach and Enrich, a program to provide additional instruction time for students struggling with math, test scores shot to the top and have stayed there ever since. Teachers have specific weekly curricular objectives; students who need more time for mastery receive an additional half-hour of differentiated instruction every day. Mesquite Elementary School, in Tucson, Arizona, attributes much of its turnaround in student performance -- and their ongoing success -- to their Reteach and Enrich program. Within the first year of implementation, even before teachers had worked out all the kinks, Mesquite went from a "performing" school (as labeled by the state of Arizona) in 2002 to an "excelling" school, the highest ranking, in 2003. The school has maintained an "excelling" status ever since. Each week has defined curricular objectives. Teachers assess students on those objectives at the end of the week. Based on assessment results, teachers assign students to either reteach or enrich sessions for the following week. Beginning the following Monday, students attend either a 30-minute reteach or enrich session every day. Reteach: Teachers reteach objectives using different lessons for students who need additional time for mastery. The teacher whose students performed best on the previous week's assessment teaches that week's reteach students. Students stay with that teacher for the daily half-hour sessions the whole week to minimize transition. Enrich: Teachers expand on objectives for students who have mastered the basics. Students in the enrich class rotate to a different teacher each day so they can experience varying teaching styles as well as learn with different peers. Reteach and Enrich (R&E) is highly replicable; every school in the Vail School District has implemented the program, and it continues to lead to improved student performance. However, there are some essential elements that are key to making it work. R&E depends on a shared set of clearly defined curricular objectives that are scheduled out for the entire year. This means that for any given week within each grade, all the teachers are teaching the same objectives. However, they are not necessarily teaching the same way; the instructional approach is left up to each individual teacher. The calendar keeps them on track by setting the pace so that teachers know that by year's end they will have taught -- and students will have learned -- all the essential standards. Says Vail superintendent Calvin Baker, "When we hold students accountable for very specific standards, and we expect all of them to know that standard, then we hold ourselves accountable for getting that job done." Everyday at Mesquite, from 12:30 p.m. to 1 p.m., the whole school is involved in R&E. In addition to this daily half hour, R&E requires time for teachers to review and assess student data as well as plan instruction to meet each child's needs, both generally and within the program. At Mesquite, each grade has dedicated common planning time for teachers while their students are in "specials" (e.g., P.E., computer lab, library time, and so on). To fit all that in, time management is also of the essence, right down to classroom transition time. For R&E, all the students transfer from their regular classroom to their assigned reteach or enrich room in under a minute, thanks in part to the convenient setup of their classrooms around a common area (see video below). Collaboration is a key part of Mesquite's culture and is essential to R&E. 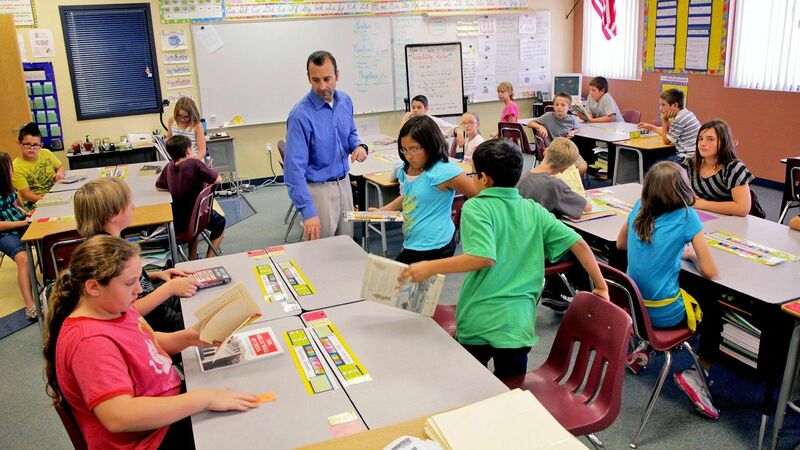 Students rotate to different teachers during R&E, so every teacher must know every student in his or her grade level. Teachers share information about their students' progress so that all the teachers in a grade level share ownership of every child's education. They plan together and share resources and lesson plans that have been successful, and they seek insight from one another on lesson plans that were less effective. Early on, the teachers at Mesquite created their own weekly assessments; now there is a team of teachers at the district level that writes them. The assessments are short -- usually just five questions on one objective -- but they provide consistent insight into students' progress so that teachers can address any needs promptly. Diane Samorano, Mesquite's student achievement teacher, tracks the assessment data and the data from schoolwide screenings and quarterly benchmarks. She meets with the teachers every two weeks to review the latest results, to identify students who are struggling, and to help teachers plan instruction accordingly. In order to address a variety of student needs, teachers must have access to resources, and principals must know what's going on in the classroom. Katie Dabney, principal at Mesquite, routinely visits classes, converses with students, and attends every data meeting for all grades. "As instructional leader, I have to stay on top of the data and be actively involved in searching for students who are at risk or need an extra challenge."